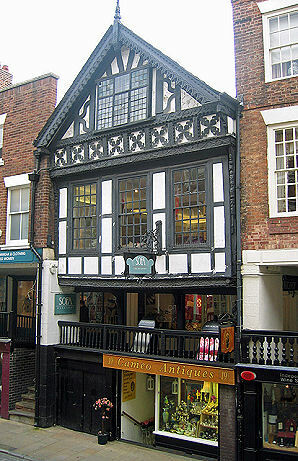 Timber framed Leche House, considered to be the best preserved medieval town house in Chester, is located at 17 Watergate Street. The building incorporates a section of the famous Chester Rows. The house was built in the seventeenth century for Alderman John Leche of Mollington, who descended from John Leche, surgeon to King Edward III. It was built upon an a far older undercroft which dates from the late fourteenth century, which was extended in the later part of the following century. Minor alterations were made in the eighteenth century. Scratched into the first floor front window of Leche house, with a diamond ring, are the words 'Charming Miss Oldfield 1736', reputed to have been etched by the eighteenth century lexicographer Dr Samuel Johnson. 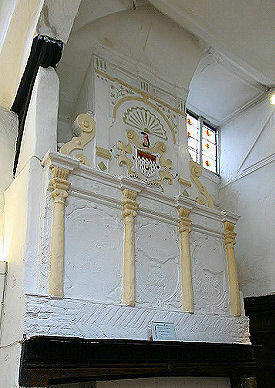 In the eighteenth Century Leche House came to be used as a public house known as The Hand and Snake. The building is now used by the sofa workshop.